High-flying Liverpool found themselves two goals down at home to Aston Villa within 36 minutes on Saturday after a poor first-half performance. Andreas Weimann and Christian Benteke had put the visitors in the lead, and deservedly so, as the Villans outplayed the home side. However, on the stroke of half-time, Daniel Sturridge got one back for the Reds after a cheeky flicked assist from Jordan Henderson. 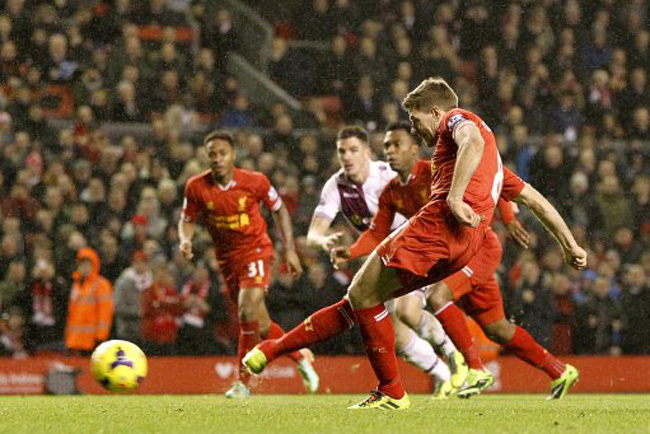 After the break, Liverpool pushed for the equaliser and it eventually came, albeit in controversial circumstances. Luis Suarez once again was at the centre of the drama, with the Uruguayan going down all too easily in the box after Brad Guzan had looked to have pulled his arms away from the striker. Steven Gerrard fired home the resulting spot-kick but despite their best efforts, Brendan Rodgers’ men couldn’t secure the win.